In his new role, Mr. Brown will handle day-to-day operations and collaborate with many departments to ensure that the policies, procedures and goals of the campus and College are met. He also will continue to build and strengthen the partnerships with businesses in the community that support the growth of internships, which lead to permanent career positions for Berkeley College students and graduates. Mr. Brown’s appointment is part of a realignment of operational leadership at the institution, as announced by Berkeley College President Michael J. Smith. Mr. Brown belongs to several professional organizations, including the Commerce and Industry Association of New Jersey, the New Jersey Association of Colleges and Employers, and the Hudson County, Northern New Jersey and African American chambers of commerce. He is also a member of the American Management Association, the National Black MBA Association, the Inroads Leadership Organization, and Alpha Phi Alpha Fraternity. 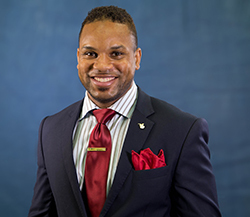 Mr. Brown holds an MBA in Business Administration from George Mason University in Fairfax, VA, and Bachelor’s degrees in both Economics and Business Management from Virginia Tech University in Blacksburg, VA.